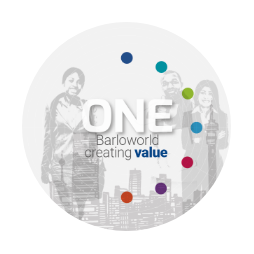 One of the group’s most vital attributes is creating value through – and for – employees by attracting, developing and retaining globally competitive people necessary to implement our strategy and meet our growth targets. Specific activities in this regard include developing internal human resources for promotional opportunities through detailed development needs analysis per person, leadership/management development programmes, and continued focus on technical skills upliftment. We have identified six Critical Success Factors that guide the group in managing its employees. 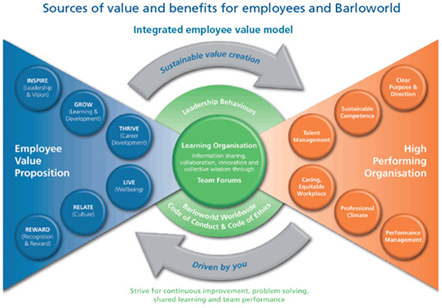 Each of these factors is closely aligned to the value drivers identified in the Integrated Employee Value Model, delivers on the Employee Value Proposition and ensures sustainable intellectual capacity and value creation competence. Through the Learning Organisation, powered by structured team forums and reinforced by our Leadership Behaviours, Worldwide Code of Conduct and Code of Ethics, employees are able to take an active role in reviewing and continuously improving organisational processes, systems and practices and building the organisation of the future. Performance management at organisational, team and individual levels. The Learning Organisation is the sustainability platform upon which the six critical success factors are based to deliver on the Employee Value Proposition. The key drivers are information sharing, collaboration, innovation and collective wisdom through structured team forums. This approach is implemented across the group in a range of interfaces and interventions. An Individual Perception Monitor (IPM) surveys employee attitudes on the status of the six critical success factors. These results are used to identify areas for attention. It has a four point scale and the group target is a rating level of at least three in all business units for all factors. In 2018, 2 385 new recruits were appointed. Total number of recruitments as a percentage of year end headcount has decreased slightly over the last year from 14.76% to 13.69% as at 30 September 2018. For 2018, males were 67% of new recruits and 71.56% of year end head count. Females were 33% of new recruits and 28.44% of year end headcount. Resignations as a percentage of year end headcount has remained between 8% and 9.6% level over the last five years. A total of 2 542 employees left the group due to resignation, retrenchment, retirement, ill health retirements, dismissal, death, termination of contracts longer than 12 months and sale of businesses. Benefits provided to full-time employees include: retirement funding, leave, medical aid, employee wellness and assistance programmes, education assistance, training, staff discounts, study leave and annual bonuses. Benefits provided to permanent employees and not to temporary or part-time employees vary by division and region. In addition to those already noted, these include maternity leave, study leave, long service awards, long-term incentive and employee retention schemes, disability cover and life cover. During the year, 227 female employees took maternity leave. To date, 205 returned to work and 22 are still on maternity leave. The focus will be on ensuring measurements are put in place to record paternity leave as opposed to maternity leave in all countries. Many males within the countries do take paternity leave but this is not currently recorded separately and therefore cannot be reported.